Okay - maybe not all grow'd up but seriously, look at this picture and you tell me. Here is my oldest all dolled up ready to go to his junior prom. 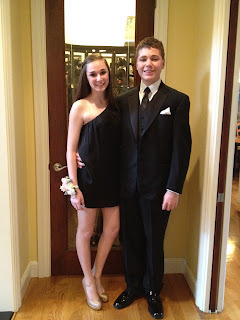 Together with his hot girlfriend. How can this be? How has time gone by so quickly? Honestly it doesn't feel like it went by quickly. It doesn't "feel" either way. But if I sit back and think of all the things that have happened in my life since he was born, I question if it hasn't been forever. Moved cross-country twice (moved three times in total but once was before he was born). Lived in six different houses. Had two other children (one of whom almost died). Got my first grey hair. Competed in pool tournaments on regional, state and national levels. Learned how to golf (not well I might add). Managed dealing with 12 consecutive years in the same elementary school (three more to go). Survived teaching one son to drive (so far). Buried my mother, grandmother and uncle. Left my husband, reconciled and then have been left by my husband. Like I said, maybe feels like forever. And I'm not old! Really, I am not. Unless, of course, you ask my teenager. More and more I am feeling happier. It's a good thing. I have my moments, but really I am seeing the sun instead of the gloom. And it feels good. I noticed the cloud between the good and the bad and it made me think of yin yang. Would I even notice the good in my life without the bad I've been living? I've written time and again about perspective. I revisit this theme again and again and again. It is true to my core. Yin yang feel related. Different from perspective, but similar too. 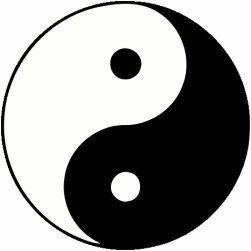 The philosophy of yin yang is, in brief, that there are opposing forces of energy and one cannot exist without the other - how light cannot exist without dark. It explains the irony of my divorce papers being filed and served on me during my first week at my awesome new job. I feel like I am rounding a bend. At the same time, I'm afraid to feel hopeful but that doesn't mean I don't feel some hope. Does that even make sense? I am moving forward. Now that the papers are filed and served, the clock is counting and there will be only six months until it's officially blessed by the state. True to my word, this will be my year of growth. Maybe since I've been enveloped in the yin, it's now time for the yang. I know there is not a lot of new content in this post. I just want to put something out here so my friends virtual and real know that I'm doing okay. And week one at Twitter totally rocked!